naijablog: Scientology comes to the rescue.. 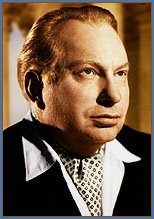 This Day reports in today's paper that over 100 books written by L. Ron Hubbard (pictured left, in his prime) have been donated to the English and Literary Studies department of UniLag. They claim the books are worth US100,000. Even if we assume 100 means 120, Hubbard's books are allegedly being donated at a 'value' of over 800 dollars per book. In London, they flog them for ten quid per tome as a marketing tool, so there seems to have been a bit of developing-country mark-up at work. This being This Day, the journalist has done sod all research and provides not one whiff of context. There is no mention that Hubbard is dead, nor that he was the founder of one of the most unbelievable religions ever invented: Scientology. It is truly a mark of the weakness of the human mind that people find Scientology attractive - so much so that a new London HQ has just opened. All you need to know about Scientology can be found within this brilliant episode of South Park. The origin story is a familiar one - a little similar to the Nation of Islam curiously enough - man comes from another galaxy, landing on earth a few million years ago and being implanted inside volcanoes etc etc. Hubbard himself was a science-fiction writer - the religion he founded being his greatest work. Quite how Tom Cruise manages to believe all this stuff I'm not sure - but having been involved in Hollywood plotlines for most of his adult life, he's probably been inured to fiction and fabulation. The really pathetic thing in this little story is that the department of Engish and Literary Studies at UniLag actually accepted the books. Rob Hubbard, Scientology: literature?? As the Guardian (UK) article (see the link above) mentions, one of Scientology's more dodgy beliefs is that 'yellow and brown' people are less 'progressive' than whites. Funny then that a racist religion should be looking to set up shop in Sub-Saharan Africa. Anyone who wants to support Cassava Republic by donating our (genuinely literary) books to the same department, please contact bibi@cassavarepublic.biz. These people need help. The University accepting the books without question (though, with the dollar amounts involved, some oga must have received some import-duty related "dash"), the journalist reporting on it criticism or context, the unfortunate kids who will be converted...it's all a perfect storm of idiocy. Nigeria!! We hail thee!! Scientology, my god, what Nigerians need now, another opiate "god". Like I am not enough?! Ungrateful sods. Why are you surprised that a Nigerian institution willingly accepts text that sees and refers to them as 'inferior'? Many Nigerians already see themselves as inferior to white people and even you must be aware of the reverence paid to you in Naija in contrast to your colleagues. Fela must be turning in his grave. Soul - if only it were as simple as an inferiority complex. Its also a superiority complex - witness the heated debate on pride on this blog a few months ago. St Antonym's probably right - there was probably a transactional inducement at work in the sorry saga. I'm not sure Scientology could get off the ground here though. Doesn't that electronic spiritual auditing equipment they have require electricity? Good point Jay!! !...on the other hand you never know; 1st son of scientology, Tom Cruise may step in with the presentation of a super-duppa inverter :-))! @jeremy: What a wonderful inducement for the church of scientology to upgrade Nigeria's electrical infrastructure! @st antonym: I'm currently not speaking to any of the other residents of the pantheon as they refuse to acknowledge my omnipotence and my impending lawsuit precludes me from saying any more. Listen Shango - if you go falling out with the other Orishas that's your business. What we down on the West African bit of planet Earth want to know is this: when is the bleeding raining season going to end? You sent a 50,000 volt bomb down onto a neighbour's roof this afternoon. Why? Shouldnt you be going on holiday about now? Btw, what's it like being half-Nupe? "I'm currently not speaking to any of the other residents of the pantheon as they refuse to acknowledge my omnipotence..."
Eshu has done well. As usual. tom cruise just needs to host a concert. Jeremy that is just one part of the problem. It is a given that those who have been repeatedly told they are inferior eventually, will work harder than anyone else to convince themselves and other people that they are indeed inferior. That unfortunately was the legacy and still is the legacy of slavery and colonialism. Nigerians will convince you themselves that they are inferior, they will buy text to prove their inferiority. Don't believ e me, walk along the street in Abuja and try to convince a regular joe blogs that you are the same with the same potential. He will never believe it. As much as I hate to say it, it is a fact that you are paid deference in certain situation in Nigeria becuase you are white and there is a belief that you are intrinsically better. I've just been involved in a situation where a Duty manager in Nigeria would not give an order until someone, anyone in London gave him the go ahead. After spending about 8 hours telling this duty manager his job and why it's ridiculous to even suggest what he is suggesting, I popped along to heathrow, got a sales assistant to tell him to do his job. In 56 minutes. it was done. we will not get past this and unfortunately, people like you Jerem will be given a heck of a lot more leeway than most of us will ever be given in our own damn country. And I say this, purely as 'matter of fact' nothing else. But as in an exchange with Eshunetics recently - the question is: how to utterly disrupt white privilege in Nigeria? Its partly a question of a nation desperate for decent leadership, and its partly a question of a revamped education sector which stands on its own feet (and of course its partly a whole lot of other issues). One aspect in the mix is that there's a whole bunch of slightly older Nigerians making various plays in country - none of whom buy into white supremacy one jot - in fact - that's the reason why they are back making the play. Its a big disgrace that the educated people that are part of the ETF and the unilag admin just seem to be ignorant!